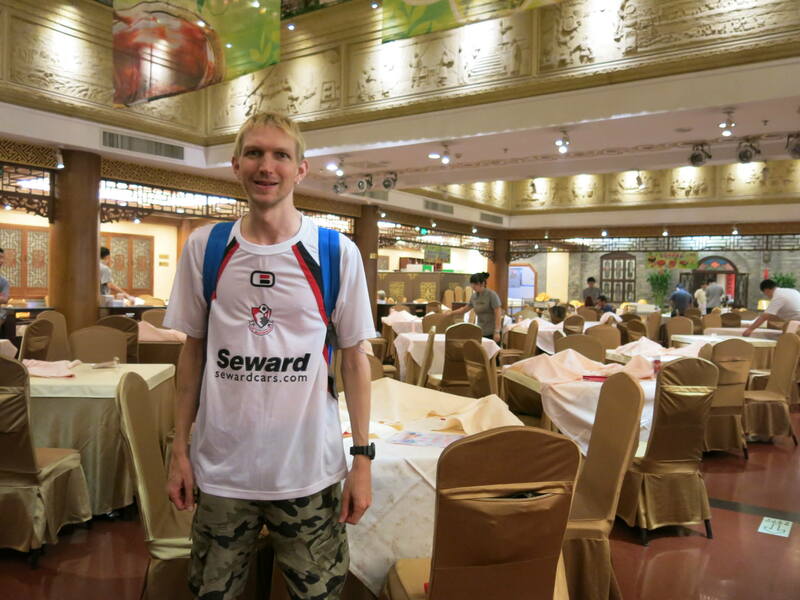 While Beijing will never be my favourite city in China, it does hold a few saving graces. 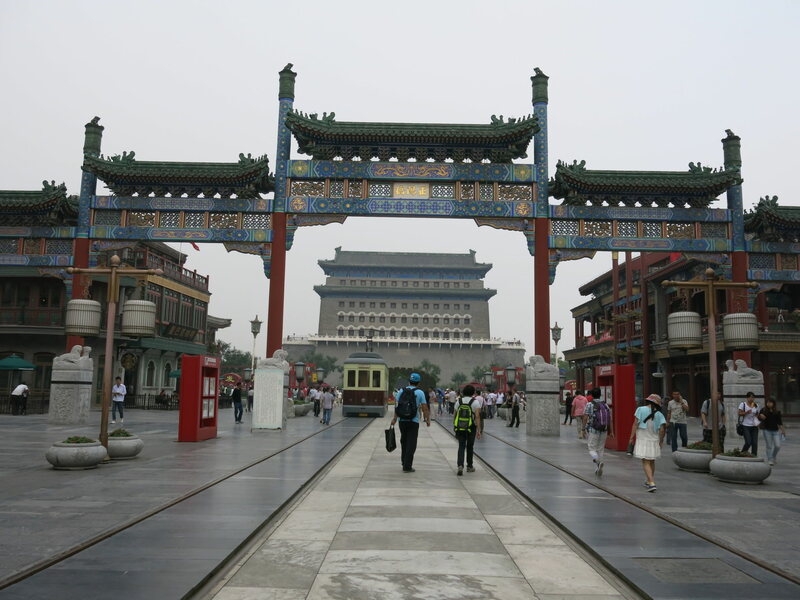 Tiananmen Square is a great place to relax, Beijing is the gateway to the Trans Siberian Railway and also for our recent trip to North Korea plus there’s Peking Duck!! 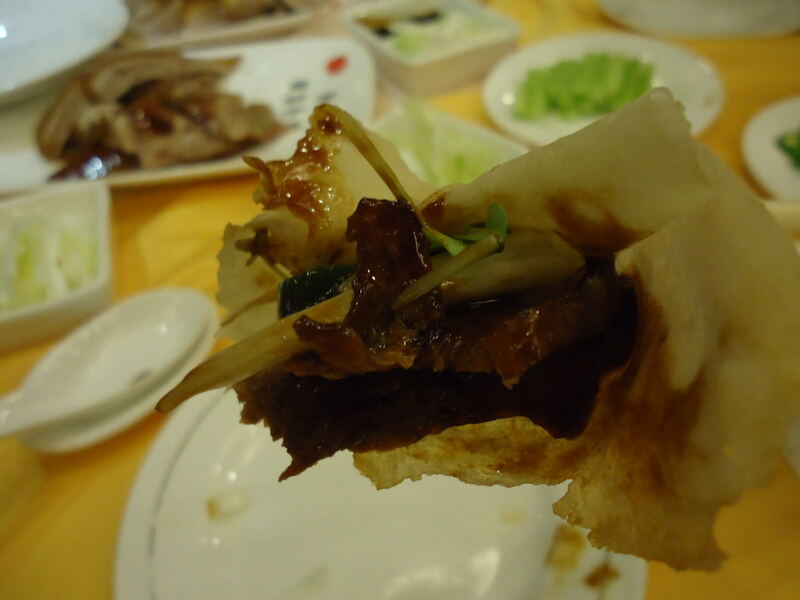 On Friday’s Featured Food I was initially going to write about my trip to Beijing in 2007 where I first tried Peking duck, but alas only 2 photos remain, no videos and the price I paid then was considerable cheaper. 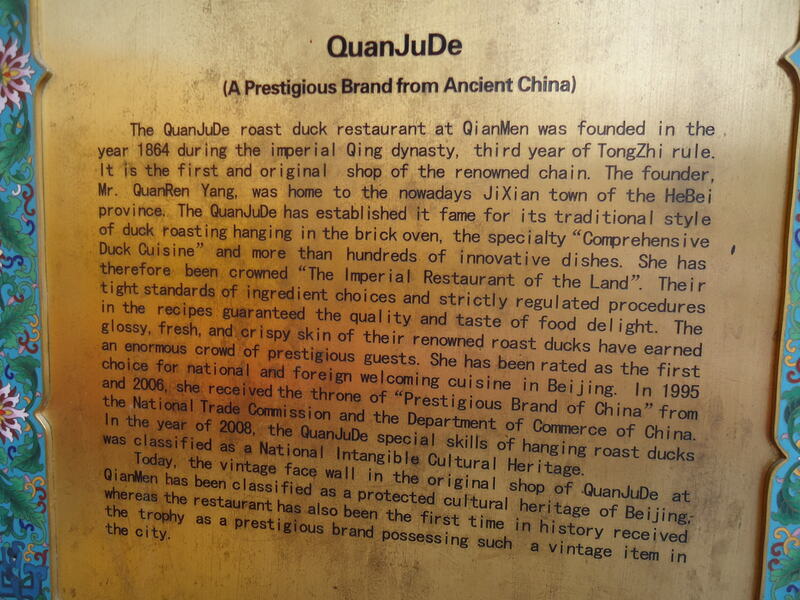 To be frank – if you want decent Peking Duck – splash out and head to the QuanJude Restaurant in Qianmen. 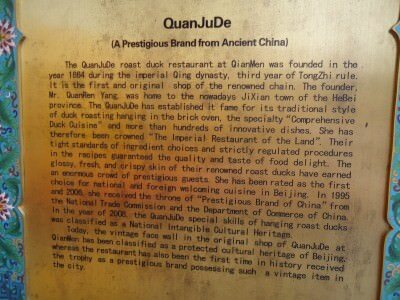 Where is the QuanJude Duck Restaurant in Qianmen, China? 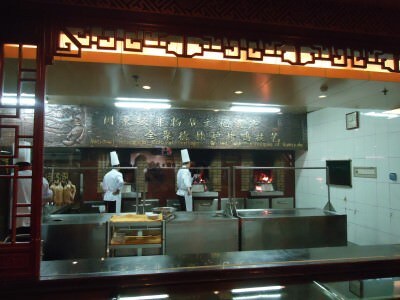 The QuanJude Roast Duck Restaurant is in a busy and popular part of Beijing. Within walking distance of Tiananmen Square and in the Qianmen district. They have their own website here – Peking Duck. It’s south of Tiananmen Square and easy enough to find. Once you see the entrance to Qianmen street, which has old style trams, is a pedestrian street and the entrance to it faces the The Zhengyangmen Gatehouse. 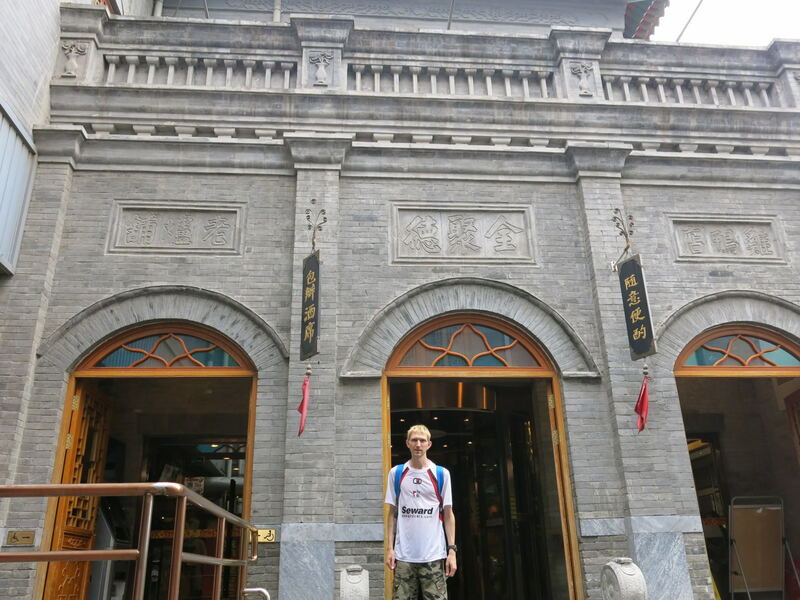 Head down Qianmen Street and the QuanJude Roast Duck Restaurant is on your left. 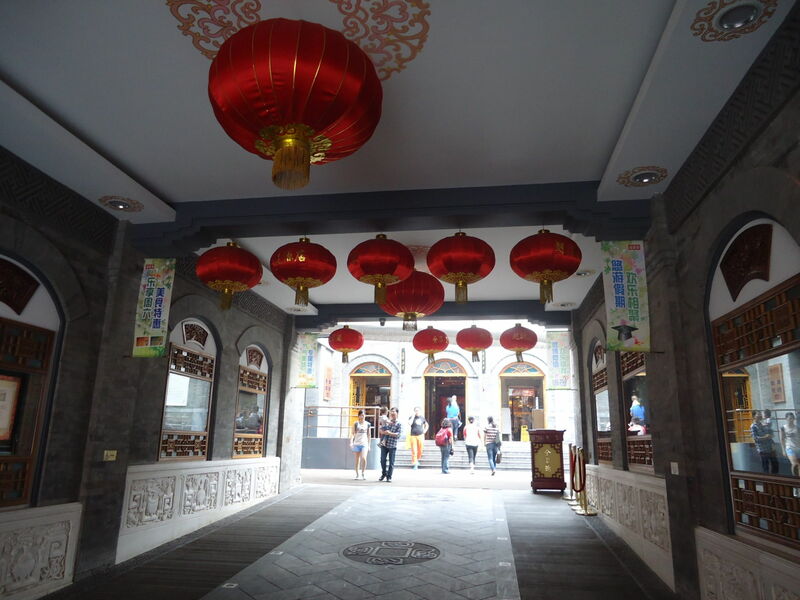 Here’s the address of the original and best one – it’s easy to find from Qianmen station. 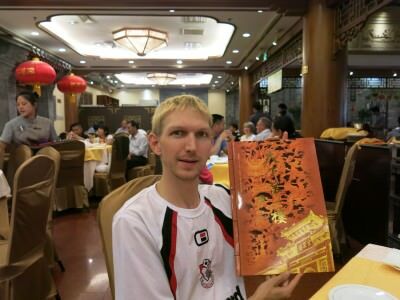 They also have branches in other parts of Beijing, as well as Hong Kong and even Melbourne, Australia. But we headed to the original one, and I’d recommend that. Outside the QuanJude Roast Duck Restaurant in Beijing, China. 1. 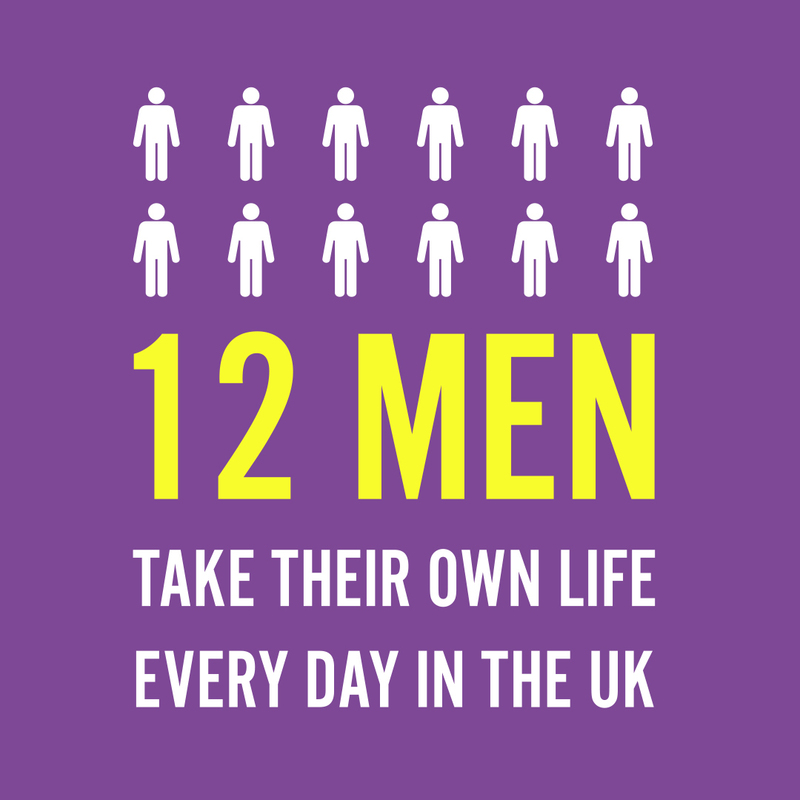 Read the information boards. 2. Pose by a plastic duck. 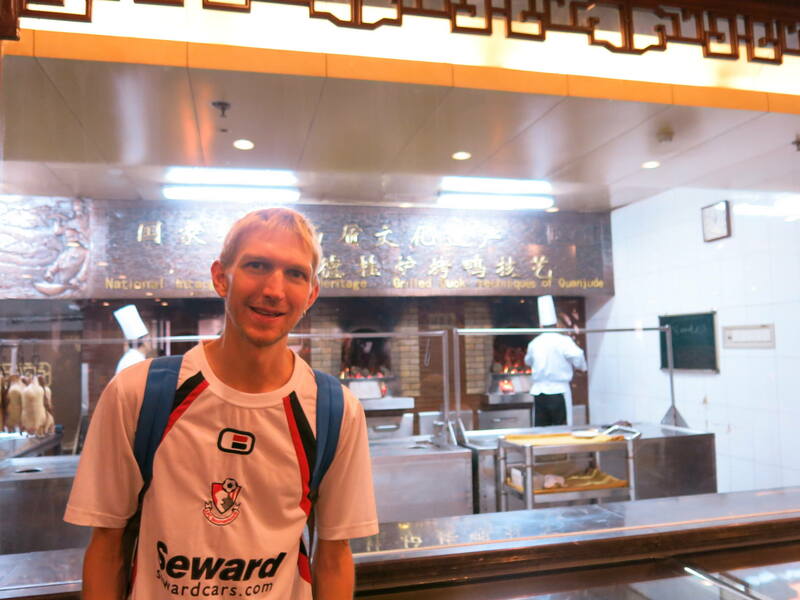 Posing by a plastic duck at the QuanJude Roast Duck Restaurant in Beijing, China. 3. Watch the chefs in action. Then you’ll be called to your seats and given the menu! It’s basically loads of duck dishes, but you should order the WHOLE DUCK. 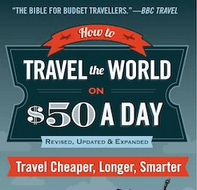 It costs 295 RMB and that’s it. Don’t order anything else – this will keep you going. Two of us couldn’t finish it – you could probably feed four people on it. So you order your duck and sit back and wait. 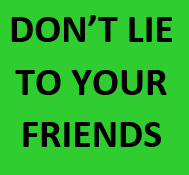 Water is free, but the tea and beer is not cheap so take my advice and avoid them. You’re here for duck so enjoy the duck and forget paying for other drinks. 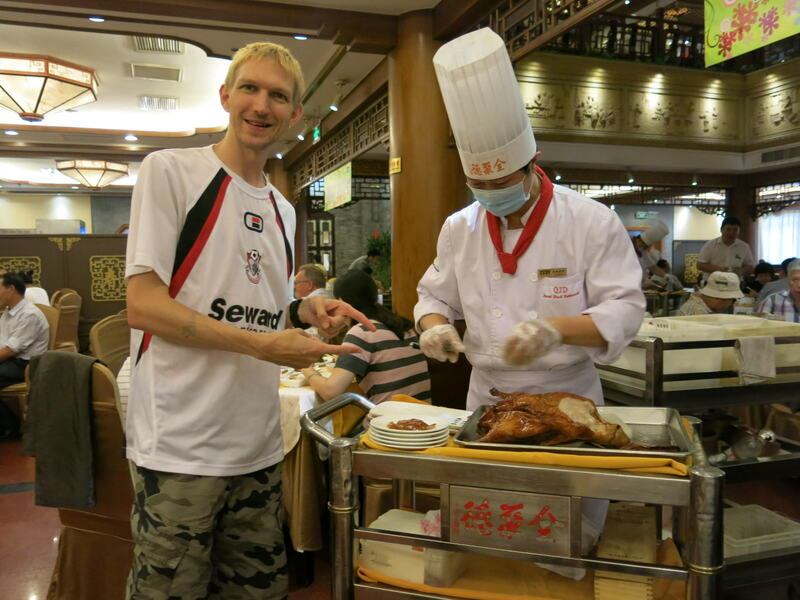 The chef comes to our table and cuts our duck in front of us! A chef will arrive near your table to slice the duck in front of you – cool or what! They slice it the perfect size then a lady shows you how to eat it. I knew the tactic to eat it already but it was cool to watch her in action. You take the slim pancake, add onion, hoi sin sauce and the duck. Then you wrap it and eat it. 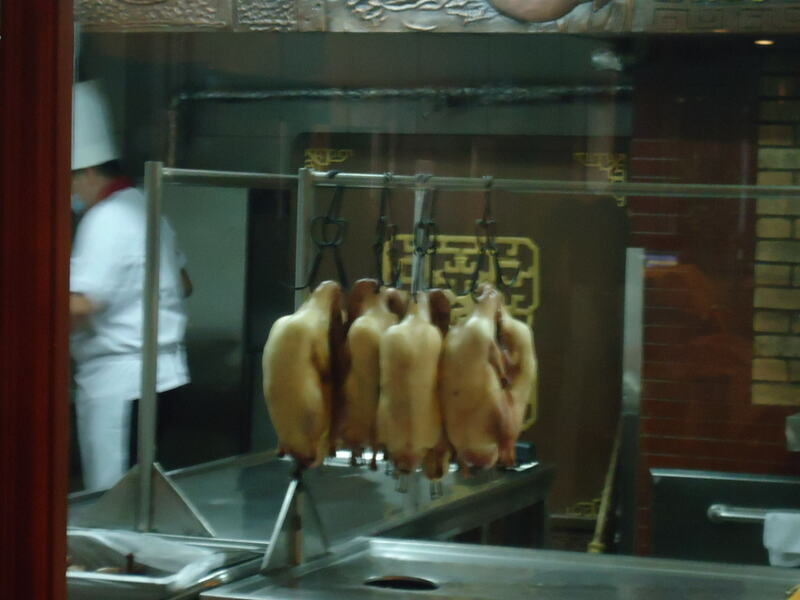 That’s how you do Peking Duck! So while I’m not a fan of Beijing, I do love the Peking Duck and I recommend it. It’s also one to tick off your list. 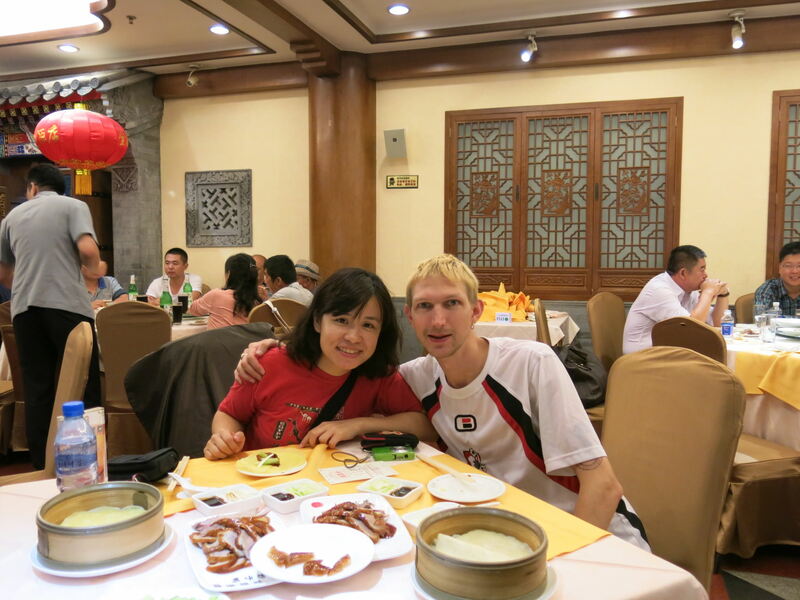 My girlfriend and I loving the Peking Duck in the QuanJude restaurant in Beijing. 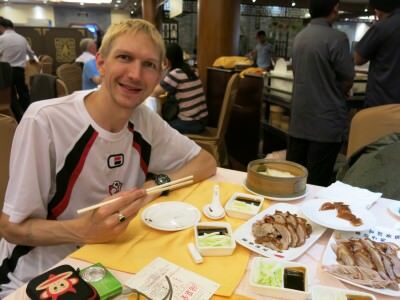 Friday’s Featured Food is an ongoing regular feature on Don’t Stop Living – a lifestyle of travel. If you have a meal, bar, pub, restaurant, brand or idea that you would like reviewed or featured on Friday’s Featured Food, please get in touch via my contacts page or my advertising page. I’d love to hear from you! I’d also love some free duck and a cold beer! Cheers! This entry was posted in Asia, Beijing, China, Daily Features, Destinations, Friday's Featured Food. Bookmark the permalink. Wow! 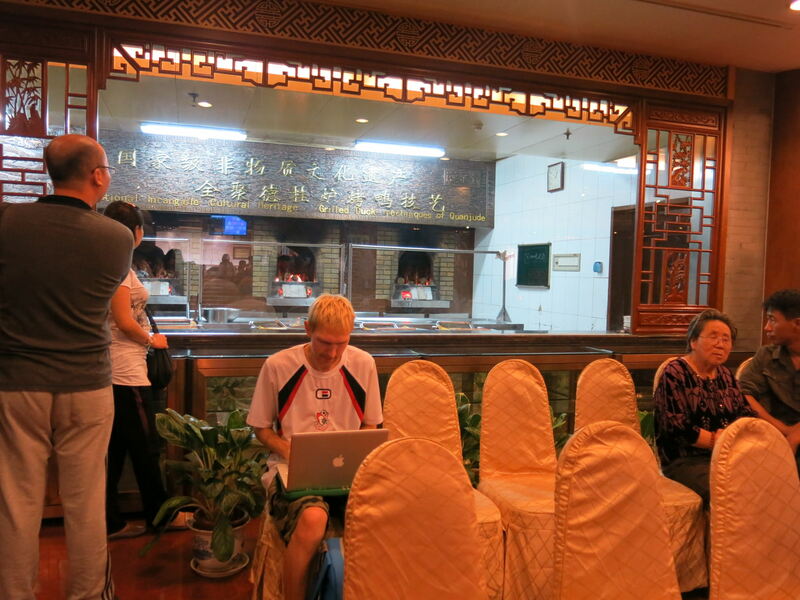 Table-side carving… that’s a nice touch.